Ignore the plot entirely, but try this Stalin point from a novel called Archangel. The story by Robert Harris, written in 1998, is about a semi-alcoholic professor of Russian history – Englishman, with a New York address — who is hot on the trail of Stalin’s personal notebooks, which he thinks were spirited out of the Kremlin by Lavrenty Beria, while Stalin was in his dacha dying. Buried by Beria’s chauffeur in his backyard, the notebooks stay where they are in what becomes the Tunisian Embassy in Moscow, after Beria is shot by the Politburo. But the notebooks turn out to be those of a girl from Arkhangelsk. Stalin impregnates her in order to leave an heir, which he does, spawning a man scarcely more believable than the others in the plot. Almost everyone in on the story dies, starting with Stalin. In 2008, the Rossiya TV Channel-1 broadcast an apparent documentary on the most popular names in Russian history. The audience for the channel is the second largest across Russia, with roughly three-quarters of the urban population watching each day. According to votes counted by the programme presenters, Alexander Nevsky came first, with 524,575 votes; Pyotr Stolypin came second with 523,766 votes; and Stalin came third with 519,071 votes. It is widely believed the votes were rigged, so noone is certain who really came out on top. What is suspected is that Stolypin didn’t come second, ahead of Stalin. Poll data collected by the All-Russia Public Opinion Research Center (VTsIOM) reported in April of 2011 Russian answers to the question: Did Stalin do more good than bad for Russia? In 2007 15% polled said they believed he had. In 2001, this view was expressed by 26%. Then 33% of the Russians questioned said he had done “more bad than good”. In January 2011, according to VTsIOM this proportion had fallen to 27%; in April, three months later, 24%. VTsIOM doesn’t say so, but if Stalin is getter “better” at a rate of 1% of the thinking population per month, this month in 2012 just 15% of Russians believe Stalin did “more bad than good”. Last April VTsIOM also reported that 45% of their poll sample think that further de-Stalinization would be an unconstitutional restriction on Russians’ freedom of speech and belief. Another 28% refused to say what they think of Stalin or de-Stalinization. They may be split down the middle between those afraid to admit anything good about Stalin, and those still afraid of saying anything bad. In April 2011, reporter Yuri Pronko asked: “How do you assess the role of Stalin in the history of our country?” His sample of 1,500 was aimed at young people between 18 and 21, living outside Moscow and St. Petersburg. With a choice of answering positive or negative, 75% said positive. 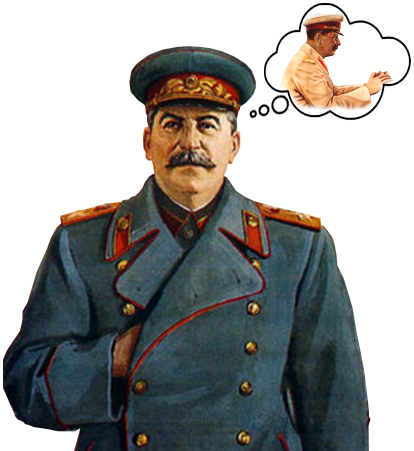 The Levada Center, another nationally known polling company, reported in April of 2011 that 45% of Russians believe that Stalin was a positive figure in history. The proportion was going down, the pollster reported. In 2010 it had been 51%; in 2009, 49%. In December 2011, analysts working for Masterforex-V, one of the largest foreign currency brokers in Moscow, reported evidence they believe indicates a rise in positive sentiment. They claim Stalin would have won the Rossiya-1 Name of Russia contest if both Nevsky and Stolypin hadn’t been boosted artificially. They also claim that there has been mass support for putting pictures of Stalin on municipal buses. According to the analysis, one of the principal reasons for Stalin’s rise today is that the terror he is castigated for prevented the widespread corruption that is the most castigated feature of current Russian life. This isn’t the place to debate what colour Stalin’s hands were, really. What is important now is what a third to half of all Russians think of their colour in relation to the problems they believe are uppermost in Russia today; and the priorities for the future they will vote for on March 4. What Russians mean when they express their opinion of Stalin is that they want clean hands, fair hands in command – not hidden, not weak, not corrupt ones. Most Russians suspect everyone contending for political power to have all three. But they think they know what Putin’s hands can do – the others are more hidden, weaker, and most likely more corrupt. The future in the hands of the opposition, if they were to be voted into power, would thus be more uncertain, more unstable, more corrupt than now. In what country of the world can an electorate be persuaded to vote in favour of that? Do the arithmetic: if about 6% of Russia’s current population (9 million) are 75 or over, and thus old enough to remember the Terror of the 1930s, World War II and Stalin’s death, those with personal reason to fear another Stalin are fast dying out, accelerated to their end by corrupt hospital administrators, doctors, and nurses who are afraid of nothing, and are quite safe from being shot for their capital crimes (names on request). The 14% (20 million) who are 65 and over are thus divided between those who remember the human destruction of the war more vividly than those for whom the Terror comes first. But they too are disappearing. They cannot make much impact when national samples are compiled for the polls. What remains is what the pollsters have found – the large, possibly growing share of the population under 65 for whom Stalin and his hands are symbols. But these are not symbols the outside world understands at all. Not to understand this (or misrepresent it as a form of Russian fascism) results in the mistake the media of the outside world repeatedly and vainly try to foist on the current election contest between Prime Minister Vladimir Putin and the opposition — both those registered in the race and those recorded in the streets and on the internet. The other symbol Stalin now stands for – clean hands — could be expropriated by any presidential candidate or opposition figure who announced that if voted into power, he will rid Russia of the oligarch system, corrupt concentration of wealth, illegal capital theft, export of jobs, destruction of environment, unfairness everywhere, etc., etc. Naturally, this can’t be expected from the oligarch candidate for president, Mikhail Prokhorov. It might be expected of Gennady Zyuganov, the Communist party candidate, but he discredited himself in supporting Mikhail Khodorkovsky after his arrest in 2003. There hasn’t been a serious Russian politician with this programme since Sergei Glazyev teamed up with Dmitry Rogozin in 2007. In retrospect, it is clear that Rogozin has understood better than Glazyev the merit of patience. Rogozin was the brains behind General Alexander Lebed’s successful but short run for presidernt in 1996. After serving in the State Duma and then as Russia’s ambassador to NATO in Brussels since 2008, Rogozin has been quietly promoted and returned home to be Deputy Minister of Defence in charge of the military-industrial complex. There are one or two others like him. Let’s wait and see where their hands end up after March 4.